RealCorp was honoured in July 2014 with a commission to manage the design and implementation of a new Lobby for the Ikano Group’s head office in Luxembourg. Originally part of furnishing company IKEA founded in 1943 by Ingvar Kamprad, in 1988 Ikano became an independent group of companies, owned by the Kamprad family. Today the Ikano Group owns, develops and manages financial services, real estate, insurance and retail companies. 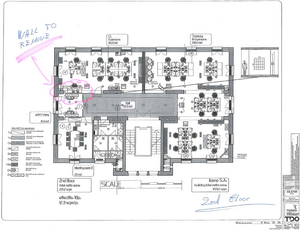 In August and September this year, RealCorp provided the client with several 3D sketches showing proposed layouts of the Lobby area. We also conducted a capacity study in September for the First Floor of the same building. The First Floor project has been put on standby, but in November the client selected their preferred sketch for the Lobby. This has now enabled us to begin coordinating and supervising various service providers. We have entrusted the work to our reliable collaborators, GSA Livange, Carte Blanche and SSILux Mondorf. 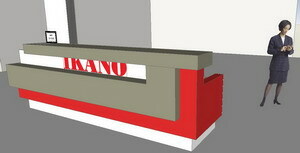 The IT installation will be managed by Ikano’s in-house IT team. 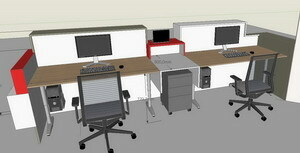 Project management will be done by RealCorp’s own in-house Architect, Monica Bocan. The aim is to deliver the final product on 15 January 2015.